The Gua Ikan cave complex is located about 7km to the south of Dabong, a small city in Kelantan. 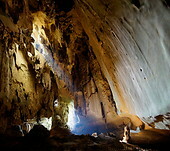 The complex consists of three caves, Gua Gelap, Gua Pagar and Gua Keris. These limestone caves are quite impressive, with large chambers, stalagmites, stalactites and other rock formations. Access to the caves is possible by car (there is a parking near the cave entrances). It's recommended to visit the caves with a guide, who will be able to show the caves highlights. A narrow and small passage leads into Gua Pagar, so narrow that in one point visitors have to crawl on the ground.